There are various models of solar cookers and solar ovens. They are all based on the principle of concentrating the sun rays on a dark cooking pot in an insulated box. A solar cooker will allow to cook slow cooking dishes like rice, lentils, vegetable dishes, fish and meat, steamed dishes etc. or to pasteurize water without using cooking fuel and without risk for the food to burn or attach. Cooking times are around 1 to 3 hours according to the type of food. Be careful on cloudy days where the temperature in the pot may never be hot enough to assure the safe cooking of meat and fish. 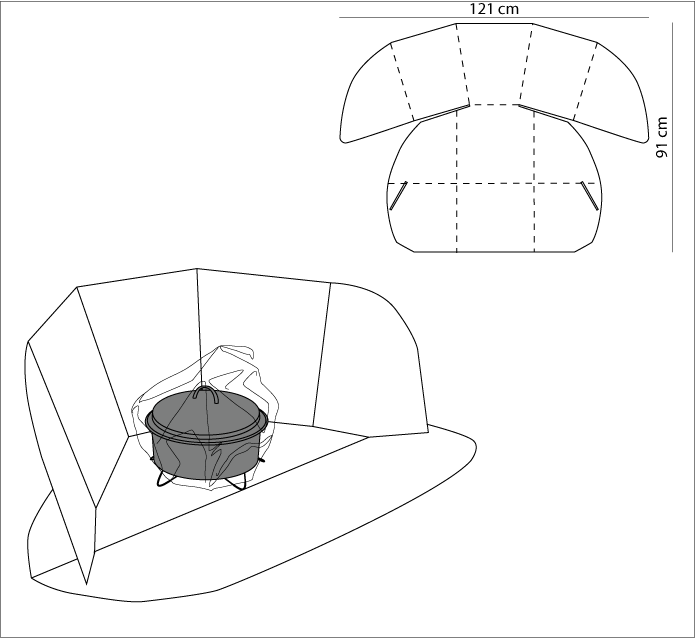 One of the simplest models is the “Cookit”: This simple solar cooker developed in 1994 by the design of French scientist Roger Bernard requires a cardboard covered with an aluminium foil (you could also recycle your windshield reflector) a black cooking pot with its black lid, 30 to 60 cm of rigid metal wire and a heat resistant plastic bag, bigger than your pot, such as the ones used to cook chicken without splashes in the oven (you can also use a normal transparent plastic bag for which you will make a wire frame so that it doesn't touch the cooking pot). Cut and fold the cardboard according to the plan in order to create a sort of flat-bottomed funnel that will collect and redirect the sun rays toward your cooking pot. Fold the metal wire so that the cooking pot can safely stand around 5 cm above the ground. Choose a sunny day. Prepare your vegetable soup according to your favourite recipe, close the lid and put the cooking pot in the cooking bag. Knot or clip the cooking bag closed and place the pot on the wire stand in the cardboard reflector. Orient the solar-oven towards the sun and be sure to re-orient it every now and then to follow the sun’s course. Start around 10 o’clock if you want to eat around 1pm, and handle with care, it is really hot…. This page was last edited on 5 December 2016, at 15:34.